Figure 1. 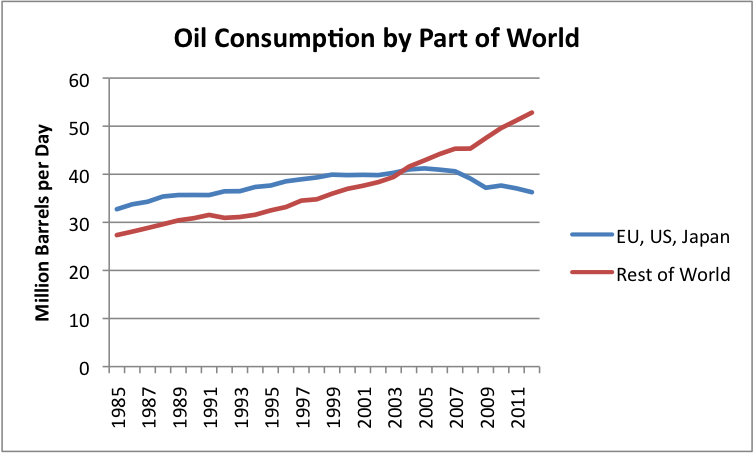 Oil consumption by part of the world, based on EIA data. 2012 world consumption data estimated based on world “all liquids” production amounts. Figure 2. 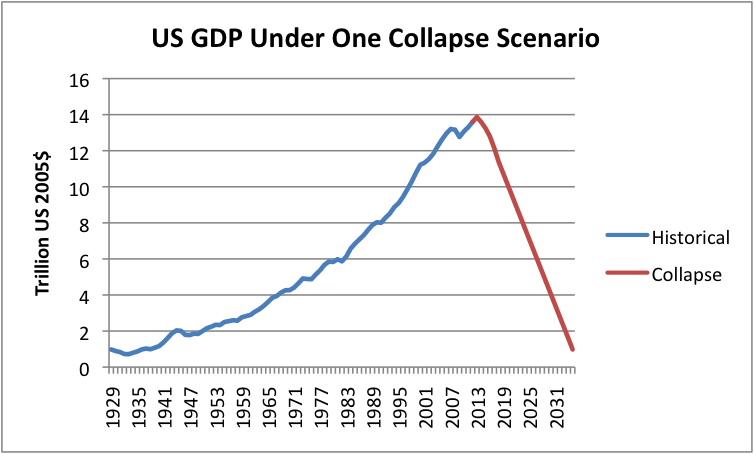 One possible future path of future real (that is, inflation-adjusted) GDP, under an overshoot and collapse scenario. This entry was posted in Planning for the Future and tagged oil limits, oil price, peak oil. Bookmark the permalink. This will be a little essay on the issue of rationing in a world of declining fossil fuel energy. My conclusion will be that rationing is impossible, but necessary. I will use two resources in my argument. The first is this presentation by Mark Vander Meer talking about the degradation and death spiral of the forests in western Montana (and, by generalization, around the world). The second is Teaming With Nutrients, by Jeff Lowenfels. This is a book, and you will have to trust me a little bit not to misrepresent what is in it. Do we agree that he has correctly identified an extremely important issue? Do we agree with his finger pointing at The Bad Guys? Do we agree that he can point us in the direction of the recovery of soil health? Are we willing to spend the time, money, and fossil fuels to fix the problems? Are we willing to suffer some loss in immediate productivity in order to avoid collapse for our children? So…the unimaginably tiny cell with an unimaginably complex factory has ‘rationed’ its energy in such a way that the right nutrients get into the cell so that it can go about its business of creating life out of dead chemicals. This system was built up over a very long time through evolution. Suppose that something happened which would steadily deprive the cell of available energy. Obviously, the cell’s current ‘rationing system’ would have to change. Is there anyone who thinks that there could be a smooth decline with a gradually implemented new design. It reminds me of the joke about the British driving on the ‘wrong’ side of the road. ‘They will eventually change, but it will happen gradually’. The Global Economy is many orders of magnitude less complex than a cell. But it is still far more complex than anything we can actually manage. 1. We aren’t smart enough to manage the Global Economy with top down direction. Therefore, the base case must be collapse. Let’s go back to the issue of the ability of the soil to hold water. That is the bedrock on which a lot of Permaculture is built. If you look at Geoff Lawton’s videos, he always worries first about water. Ben Falk in Vermont worries first about water. Now here is the peculiar thing—humans can IMPROVE the ability of the soil to hold water beyond what unassisted Nature can achieve. Water runs rapidly downhill. The alluvial deposits all over the world testify that Nature has been eroding the high spots and depositing the eroded materials in the low spots for eons. Humans know how to slow the water down and let it sink into the soil. That is precisely what Lawton and Falk are doing. It is done with Terraforming–earth works. While humans and draft animals CAN do terraforming, fossil fuel powered machinery is awfully useful. Once constructed, the earthworks will last for thousands of years. Earthworks which manage water are Capital in a way that money profoundly is not Capital. And water which is well managed by humans greatly increases the fecundity of Mother Nature. Making the world more hospitable to humans. Lest we get to proud of ourselves, beaver do a pretty good job of managing water. 1. Individuals and families and extended families and intentional communites should get about managing water to protect themselves from societal collapse. The problem is that someone who is interested in Terraforming has to first buy the land, and then invest the energy resources in re-sculpturing the land in the right way. This will happen on at most a tiny percentage of the land. I am a little skeptical about earthworks lasting for 1000s of years, by the way. Maybe, if later generations don’t decide to “improve” it, or subdivide it for a large family, or make some other change. It is a nice thought, but without a decision by society to invest huge amounts in this direction, I don’t think it will happen. I looked at it a bit, but couldn’t figure out how to install it. Maybe I will get a chance to get help from a family member later. Ben Falk did some research on things like terraces. There are hand built terraces in Asia which are very, very old. He shows aerial pictures of them in some of his talks. As for subdividing the land…I suspect that having a finite land resource restricts family size. That was true in Edo Japan. When moving to town to take abundant industrial jobs became possible, then the restrictions on family size disappeared. If land for self-sufficiency once again becomes very important, then we may go back to the thought processes of Edo Japan. But I agree that nothing will be done by ‘society’. Any action will be by individuals, families, or small purposeful groups. Yes Don, that is right there is still much old infrastructure left over from the old days that survivors may rediscover after collapse. The other day, I was talking about the old river ways on my post and they are still there and overgrown, but they can be trimmed up and put back in shape. Perhaps a World Made By Hand as James Howard Kunstler wrote about and also Gail subscribes to the same theories/outlooks. Nicole Foss also shares our views on how peak finance may arrive before peak oil and really bring the storm early. Although, it is clear that these old waterways and old systems are not set up to feed 8 Billion. That kind of makes my point that it will be there for those that live through the change and start over, the old pathways will be there and freeways too but they will likely rot and decay pretty fast if not maintained. But they are still out there and may be used again someday. I read a book called Earth Abides once and interesting tail of only a few people living through a disaster, only those that were rattle snake bitten! I don’t understand all these references to “when peak oil arrives” – it has arrived. Maybe some people, even those who subscribe to the peak oil theory, have been successfully misled into believing that what is referred to as oil in the MSM is actually oil. It isn’t. The world stats all present Crude and Condensate (from gas wells) as being the same thing, but they have quite different hydrocarbon profiles and energy density. You can use reforming to turn Condensate into heavier hydrocarbons, and then refine them in the usual way, but that is not the same thing as Crude Oil. NGPLs are not oil either, though they can be used in suitably modified vehicles. Ethanol and biodiesel are not crude oil, and kerogen from tar sands isn’t oil either, so “All Liquids” is not what we mean when we say Peak Oil. This is world production of All Liquids: http://www.peakoil.org.au/charts/world.all-liquids.prod.2001-2010.gif . Australian statistics do split Crude and Condensate, see http://www.peakoil.org.au/charts/australia.oil-prod.split.1982-2010.gif . Now Australia is not necessarily representative of world production, but world Natural Gas production is still rising, so Condensate production must be rising. So you can see that Crude+Condensate hides the fact that Peak Crude Oil must have happened. And if you consider Crude Oil split into Conventional and Heavy, deep off-shore, etc, Peak Conventional Crude Oil is well past. We’ve got US, Europe and Japan in recession, with sales of refined products down in all categories, pedal-to-the-metal economic stimulus, near-zero interest rates, record-breaking investment by oil majors, and STILL the price of Brent is $104 /b. I don’t know what more proof anyone needs. I get your point, not much good to report on the financial front or the energy front. Central Banksters with their foot to the peddle to the metal. Not to want to be a doomsayer, but.. War seems to be breaking out in the middle east and may spread to the N. Korea. Meanwhile shortages quietly developing as our larger fields are depleting. Looking at the situation in Syria today, I went out and filled both my truck and car and gas cans and I want to have bit around in case we have a shock or something, at least I have some gas for my generator, but you know a tank of gas is a tank of gas and will not last long. I do have a plan B which is a harder situation for all of us but we stay going for awhile. Not sure about Plan C though that will be harder yet. This thing looks like a fire cracker ready to go, so I am working every month to do a little bit to have some stuff put aside, this month I was gas which cost me about $130 to fill my cans plus a car and truck, not cheap. I was just wondering how awful my yard would look without the mower cutting down the tall grasses this time of year, if I have to do it by hand, I would want a goat or sheep I think. Just think if you went to the store for the last time, what would you want? ‘If you went to the store for the last time, what would you want?’ Maybe a case or two of malt whisky………..
We can all provide against a shock to the system quite rapidly by buying in extra food, etc, each month. It’s worth it, and our ancestors did it habitually, only the supermarkets have lulled us into thinking it isn’t necessary anymore. Even in Britain when there were just a few extra inches of snow recently, really trivial, there were reports of crazed people racing into supermarkets and sweeping anything they could off the shelves, so little prepared were they for the smallest hiccup in supplies. There’s is no need to be among these fools. Relative to the age of water works and their longevity. The first 3 articles are about terraces in Asia and the Andes, where some of the terraces are thousands of years old. The acequias in New Mexico, which are irrigation ditches, are around 350 years old and are an integral part of local government. Each ditch is self-governing. You can find state Supreme Court cases involving disputes between acequias over water. The acequias came to New Mexico from Spain. 1. Water is really important. So important that a lot of human labor will be expended in the absence of fossil fuels. 2. Well constructed land forms are quite resistant to decay from natural causes with proper maintenance. 3. Yields with good water management can be very good. 4. The necessity to manage watersheds tends to force neighbors to cooperate and form governmental, or quasi governmental, units. The Mayor-Domo of a New Mexico acequia is an important person in the local community. Leading largely by example and persuasion–much like a village chief in a hunter-gatherer society. 5. A limited water supply per family tends to limit the size of families (in the absence of emigration possibilities such as The Big City or The New World or The Military. Amazing rice terraces, so much work my back hurts looking at the pictures. Human labor can do a lot especially with a mule or two. One thing that came to my mind is like int he Andes and Himalayas where most of the water for so many of these fertile valleys is about to dry up because the Glacier that supplies the water is almost melted. So many dependent on that water and it is about to go dry very soon. I know this is a bit off subject but sending this for my friends in the UK and elsewhere that remember the past! Turning back the clock to our favorite Peasant Girl. These were simpler times for sure. Fleetwood Mac: Gypsy Live – Mirage tour 1982. Quality music seems to be lost these days something from the past? There are wonderful old terraces in Spain built by the Moors: many abandoned now of course due to the unviability of small-scale farming. Probably built by Christian slave labour (much as I once saw a deep well cut from the rock by Turkish prisoners in Austria.) They can indeed last a long time, even when neglected. One of the tragedies of modern agriculture is its short-termism, created of course by the ease of global transport in the oil-age: English agriculture, which had reached a peak of sophistication, was wrecked in the 19th century by cheap Australian cereals and meat. On my family’s old estate in Spain which we had owned for 800 years, the olive trees were all cut down 20 years ago by new owners in order to plant cereals which were less labour-intensive and more profitable then. Those trees were all at least 300 years old, many much older. In Mallorca, one can see olive groves 1 to 2,000 years old, still well-managed. It’s a wonderful thing to stand by a living plant tended by man for that length of time: Roman, Muslim, Christian…….. The wisest rich man I know, in Spain, refuses ever to go to town, and spends his days tending his vines. Our ancestors could build and plant with centuries in view, and our elites have trouble seeing to the next election. The European Union is now encouraging the import of agricultural goods from North Africa, where they wish to extend political influence, and this is yet further undermining the old, smaller family farms of Spain. I suspect you are right, there will be no wise planning, only collapse. ‘Are you a man to work in the fields? Cutting down those old olive trees sure is a good example of blind greed which seems to have brought us here to the brink of collapse. It is nice to hear about the old guy that refuses to go to town and tends his vines. Sounds like he is one of the few that care about the land its living things. Many people have somehow lost their connection to the Earth and instead serve a different master of corporate greed. I have a deep respect for the American Indian and people that respect the Earth. The Indians managed to live here a long time and did no harm to the Earth. I guess it is too late for us to go back to the way of the Indians. However, those who survive will likely have no choice and to survive it would be necessary once again to live like an Indian. That could be our future. The old man and his vines is very rich – from wine. He could be in the city with people fawning over him, but you can hardly get him away from the land. He rented his beautiful old country house to one of those mega-rich football stars, (his wife doesn’t like it and so he has to live in a modern one to please her!) and put in a new luxury swimming pool up to his tenant’s standards, my cousins installed it: ‘Incredible, isn’t it,’ he said, ‘what rubbish people care about? !’ Needless to say, the footballer doesn’t set foot on the land…. There seem to be many sane and decent people around, but they’re not in the driving seat of our societies, that’s for sure. Sounds like a very nice old guy and a truly good man. The world could use leaders like him, but you know that people like him are most likely not interested in Politics. He comes from a dying breed but good to know there are still some folks like that out there. In America many of our farmers are older, I had read. I think the average age is close to 60 which also does not bode well for our future. Many of the kids have no interest in managing the farm and have gone into the cities. The advantage of big trucks over pickup trucks is 11 to 1. Big trucks are not quite as efficient as rail which is not quite as efficient as water transport. 2. An efficient garden uses little powered transport. Some seeds may be ordered and delivered by mail, but they don’t weigh much, don’t need refrigeration, and so are pretty inexpensive to ship. The article also points out that perishables such as fruits and vegetables cost twice as much to ship as staples such as grains. Gardens typically grow fruits and vegetables. 3. It is entirely possible to operate an inefficient garden. Peat moss shipped in from the tundra and ‘organic fertilizer’ consisting of bat guano. Irrigation water in Phoenix. Therefore, only truly efficient uses of fossil fuels, particularly for transport, are likely to survive. Shipping grains by rail and water may well be survivors. Shipping fresh fruits and vegetables may well not survive. In addition, many gardeners add a lot of purchased nitrogen and phosphates. A resilient gardener must learn how to use natural sources of nitrogen and to conserve phosphates. These aren’t rocket science, but they have to be learned and practiced. Both are likely to be rare in the future. 5. The fresher a fruit or vegetable, the more the micronutrient content is available for human use and the more health supporting is the consumption. There is nothing as fresh as kitchen garden to kitchen to table. 6. Efficient gardening has a learning curve and requires the building of physical capital such as water conservation mechanisms and fertile soil. Therefore, the wise person probably gets started right now. In addition, money as capital is probably worth more now than it will be in the future in terms of purchasing real capital assets. Yes, seed are part of our plan, we have them in #10 cans that we bought sealed and keep them in the fridge and also in cool closet. They do last for years. I just invested some more money in my garden today because three deer came through here early this morning and cleaned out the strawberries. My wife was unhappy as she has been watering them every morning. Bought some cedar and chicken wire to build some screens to keep the deer mouths off some of the garden beds. A bit of work and I am going to get started on it tomorrow. So my wife got after me to cover it and so today I went to buy some chicken wire and cedar that I plan to cut up into smaller pieces to make a deer cover for some things. The deer do not bother the squash and corn too much if it is up and not young. So we are learning about more each year. I am going to do strawberries and spinach etc under wire this year. The point I wanted to make is that your harvest will all come in at once (if not plundered) and what I do is dry it in a food dehydrator things that are favorable to do that with that are excess like, corn, squash, bell peppers etc. Then jar them with Oxygen removers packets that I buy on line. They keep for many years, but be sure to get it really dry first. I also make Beef Jerky with this machine and any other kind of jerky you want. Especially in the fall in the harvest time the machine runs out side and works better in the heat. The food dehydrator is a useful machine to have in the house and the solar one I plan would work too on a sunny day. But it takes two or three days to do batches of food in the machine so weather in a solar thing could be harder. There is always canning in bad weather using firewood etc. I have plans and parts to build a solar version of the food dryer that will only work on good weather days. So drying or freezing or canning is a thing we should should all learn again, something from the past once again important along with all those waterways and paths still out there to be reopened and cleared. Many old systems still out there that could be restored by a much smaller population (less than 500 million perhaps) of survivors but those systems are far short to feed us all now at eight billion. Lots of things can be done. Everyone needs to find the right balance between trying to do everything (impossible) and not doing anything (the road to disaster). Did you read Albert Bates account of his weekend at Sandor Katz’ house–fermenting just about anything and everything. Fermentation was the preferred method of preserving in many places a couple of hundred years ago. My daughter has built a solar dryer out of a repurposed paper towel dispenser like you see in restrooms, and she ferments a lot of stuff, and she also dries. She is canning much less. She keeps chickens for both eggs and meat, and has a pretty good garden. All this on a small urban lot. I tell her she needs to plan her dating life around the help she needs. E.g., Man Wanted. Must be good at killing and butchering chickens, etc. OR Man wanted. Must be fearless while climbing unstable ladder high into cherry tree. PS We are going to need to go back to hunting deer and squirrels very quickly. We aren’t going to be rich enough to build chain link fences around everything. And squirrels destroy way more than they eat…so the meaning of a ‘squirrel gun’ will become apparent to every school child once again. I have been thinking of these simple ways, we are just not yet ready to eat some of these critters yet as we are spoiled on chickens. But as the saying goes get ready to eat Crow! Fine so long as you appreciate that this only works so long as you can go to the shops and buy the things you need, and that your title to the land is only assured so long as the Land Titles database remains on-line, the police there to arrest thieves, the courts there to prosecute them , the prisons there to lock them up and the energy there to run the telephones, internet, banking system, shops and transport services. We can’t help but be enmeshed in the society at large, however self-sufficient we try to be. But modern society is now so complex and lacking in resilience and therefore fragile, that the very fabric of society could go into grid-lock at any moment. Why has the power gone off ? I don’t know – the phones aren’t working. I am reminded of a TV documentary I saw recently where three African tribesmen, armed only with machetes and spears, walked up to a group of about eight lions feeding on some carcass, and calmly hacked a leg off it and walked away with it. That is what humans have been doing for tens of thousands of years. Yes Dave, I get your message loud and clear. I think – the best I can do is to improve my gardens and knowing it is little, using well water and having back up system with seed and freeze dried foods will buy us a bit of time. But I do not like to eat the freeze dried foods, I prefer to eat from the garden. It is not nearly enough, I think each of us would need 10 or more acres to survive and grow enough food and animals that is only if we cooperated and helped each other. One has to ask — How many of us have ten good acres with animals, water and crops that are suitable for survival? I think Gail’s message is that the Earth no longer has 20 or more acres of land with water crops and food for each of us which is what we really need. Thanks for the links. I hadn’t seen those precise transport numbers before, but had heard that that was the general direction of the difference. I am not convinced that I am all that efficient with my own gardening. I buy trees that are already partly grown, for example, because I don’t want to wait for the rest of my life until they produce.